With this tool, you can create tests, check performance, write code faster, include more tools to develop, test, and monitor SQL Server in an efficient manner. I have been working with SQL Server for 18 years and I was looking for a good way to develop my software, scripts, and stored procedures faster and more efficiently. After testing several tools, I found this nice SQL Server add-on for SSMS. First, SQL Complete will help you complete your T-SQL sentences faster. It will complete your sentences clauses and generate code automatically. Secondly, Search will help you find not only objects but also data in tables. The next software is Documenter for SQL Server. This add-in will help you generate documentation automatically and save the documentation in different formats like HTML and PDF. Data Generator is another extremely powerful tool that will allow you to generate realistic data for testing purposes. Another interesting tool is Source Control. This tool allows you to administer database changes in a source control software like SVN, TFS, Perforce, Git, Mercurical, and SourceGear Vault. Also, we have Monitor, which will not only monitor but also analyze the database performance. Query Builder is another powerful tool that will allow creating complex queries in seconds. Unit Test will help us detect bugs by executing a unit test to verify if there are errors in the code. The indexes are always one of the simplest and cheapest options to improve performance. With Index Manager, you can receive useful index recommendations and help with fragmentation problems. 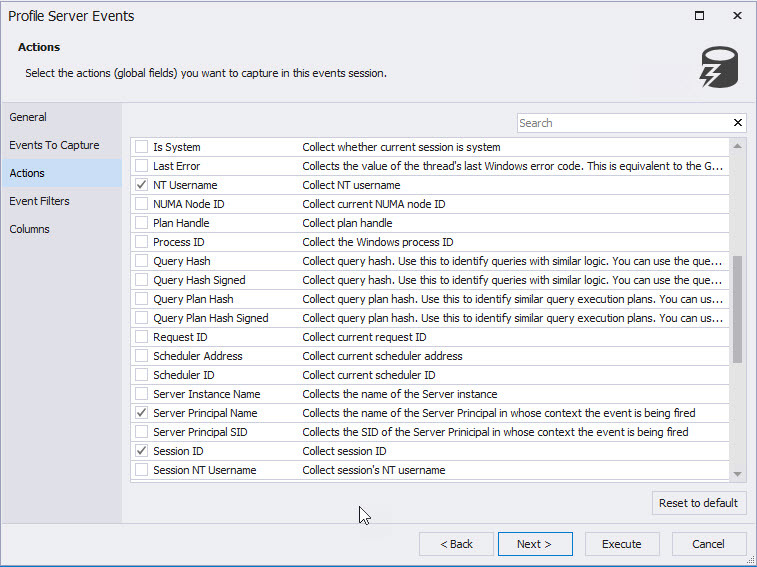 Event Profiler is used to analyze data and sessions. 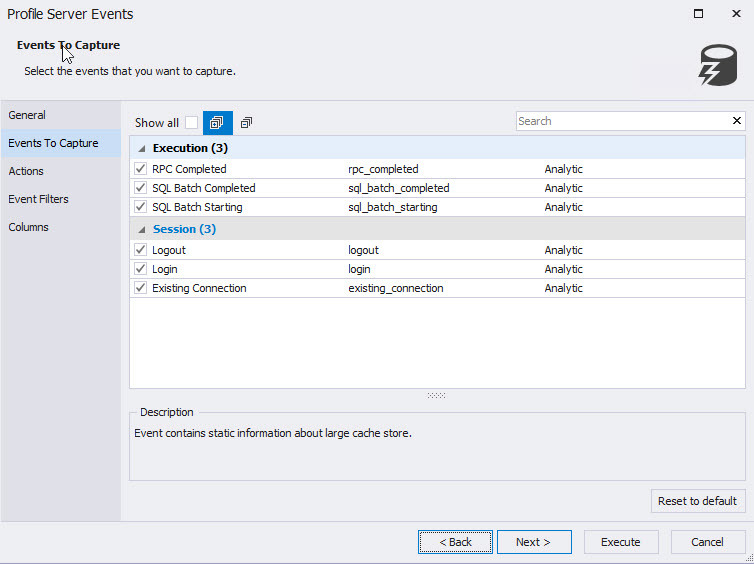 You can monitor the database engine, SSIS activity, and SSAS activity. It also helps to identify performance problems, errors, and warnings. Also, you can analyze execution plans. Schema Compare is used to compare database objects like tables and stored procedures. You can not only compare but also synchronize the databases. Data Compare allows you to compare the data of tables or view and verify the differences between them. You will also be able to synchronize the data. SQL Decryptor is useful when you encrypted your code and you need to recover it. With SQL Decryptor, you can decrypt different objects like stored procedures, functions, and triggers. Data Pump is used to import and export data. It supports different formats like JSON, CSV, XLS, XML, ODBC, and more. You can check the sentences highlighted. 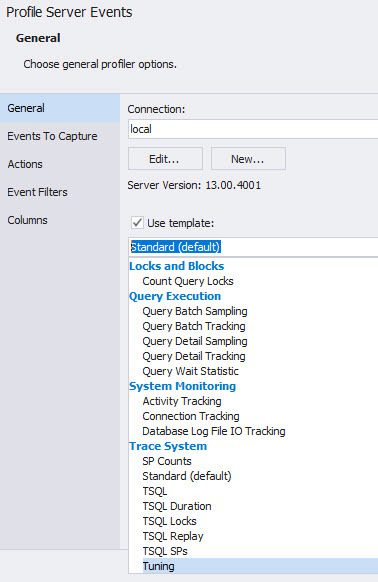 You may find Event Profiler equal to the traditional SQL Server Profiler included with SQL Server at first view. However, it includes several advantages. 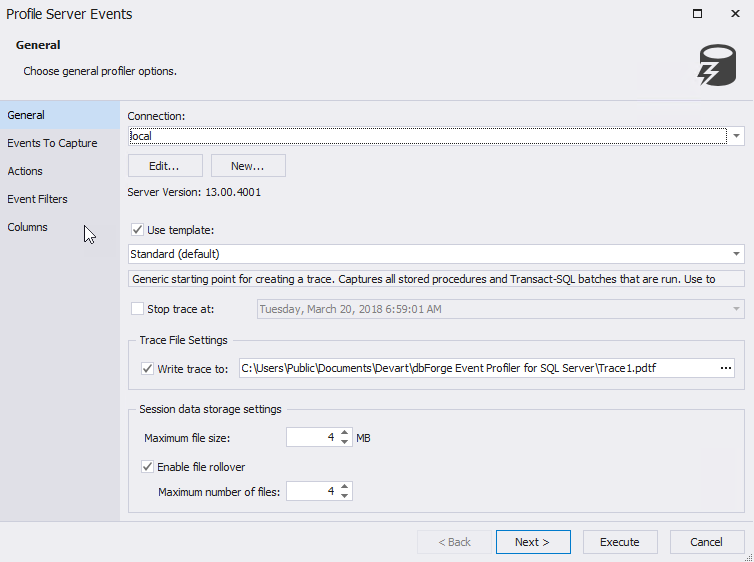 As you may know, SQL Server Profiler will be removed in future releases and it will be replaced with the extended events. This is because SQL Profiler is very slow. dbForge Event Profiler does not consume a lot of resources like the Native SQL Profiler. In SQL Profiler, it is recommended to run it on a remote computer to avoid resource consumption problems. This is not the case with Event Profiler. It supports extended events, which means that there are events in SQL Server Profiler no longer supported (because it will be deprecated soon). This tool can trace 1,000+ events! The tool was designed to work with an optimized performance consuming low resources. You can filter and sort data in the grid to narrow your results. The fourth tab contains the Wait Stats. It contains statistics like the wait count, wait time, and average time. This information is useful to check if there are performance problems. 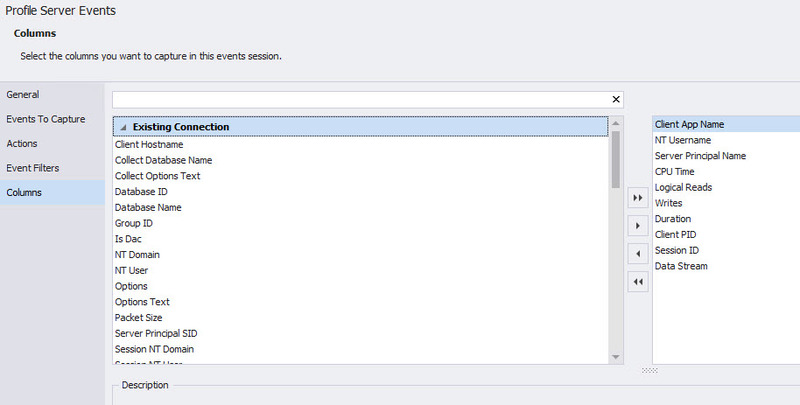 The sessions will show the active sessions in SQL Server. It is useful to monitor the database being used. Finally, we have the option to check the backups per database and the path. In future articles, we will explore some of the main features of the other tools. As you can see, they include useful and powerful options. If you are a DBA or a developer in SQL Server, this tool will save you a lot of time. You can create tests, check performance, write code faster, include more tools to develop, test, and monitor SQL Server in an efficient manner.